You look so cute in this. 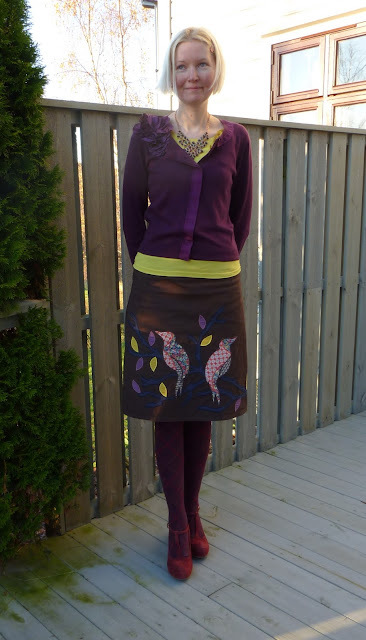 I actually had that skirt for a while, and sold it about a year ago. :) I just couldn't make it work for me, but I love the way you styled this! The necklace is adorable, btw! Aaw thanks Dina! :) A pity you had to sell the skirt but there is no point hanging on to clothes that dont work for you. So much colour - so pretty! I love the new necklace. That skirt is so pretty! I love that it looks as handmade and those patchwork details are so quirky! 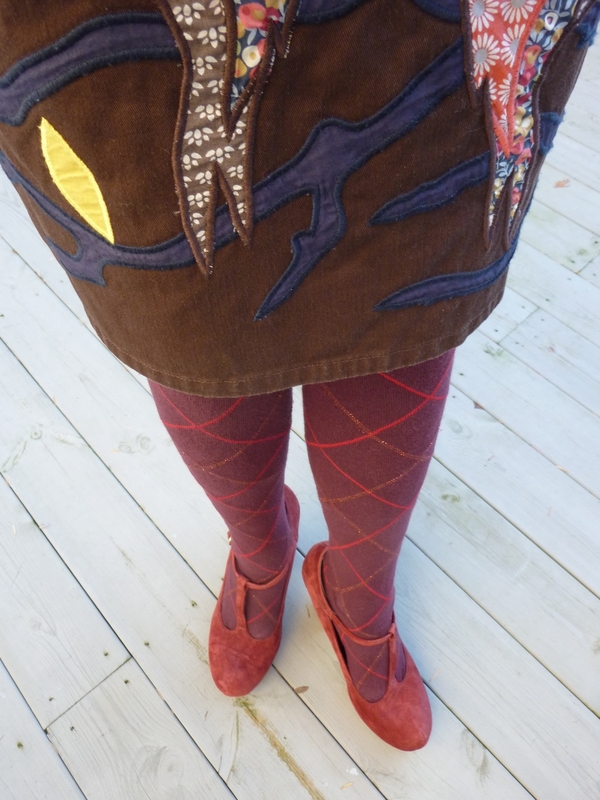 Great how you played with colors and patterns, I really love your very original style! Really cute skirt! I keep coming across a boden dress in my thrift store. I'm always so excited to see it, but it's much too large for me. Hopefully it will make someone else happy. Aaaaaww Ariane, youre the best!!! Thanks a billion for featuring little me on your blog, Im really touched and honoured. :) I will certainly try to wear more necklaces. I like the bird skirt. Boden makes such cute things! Hi Monica, I just saw you on Ariane's blog. I love your outfits, full of colour and unique styling. I make beaded jewelry so styling with bracelets and necklaces is fun for me. I keep my fun bling out where I can see it. Helps me to remember to put it on. Really beautiful details - the necklace, floral ruffle, and birds - and as always, gorgeous colours! I am happy that you are happy- you are such good material Monica! One of a kind! I put my post about you on 2 blog hops so i might get more comments or followers, will see hey! Aaaw, youre too kind Ariane! Monica, I love the birds on the skirt, and your statement necklace :) I'm one of those that things no outfit is complete without one piece of bling. Maybe two...lol. Yes, Ariane has a good eye!! I'm visiting because I saw you on her site and I'm so glad to find you!! Your use of color and composition is spectacular. I loved the interview too. I'll be back. it is very cute as usual Izzywizz! 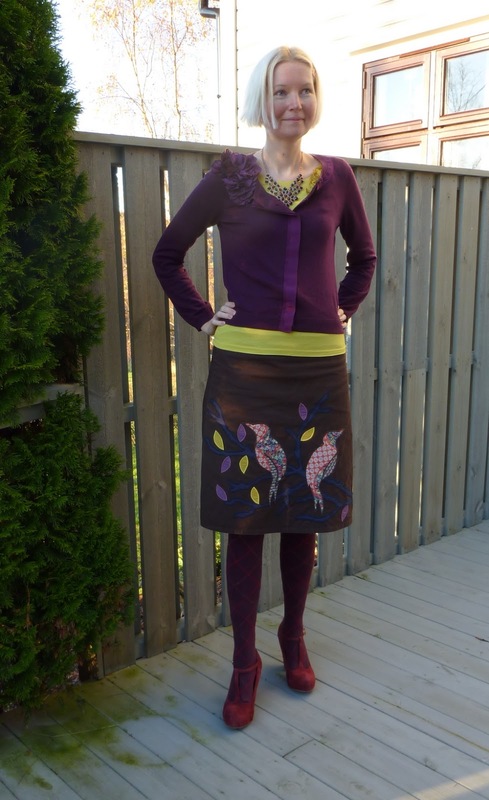 Sorry I'm so late, but you look so lovely in this fall coloured outfit! The Boden skirt is amazing, I bet you get a lot of wear out of it. I love your shoes too, they're so elegant, and the colour is gorgeous!